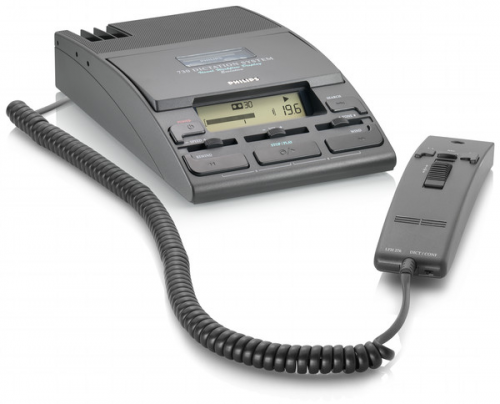 The dictation system 730 is designed for user-friendly professional-quality dictation. All major dictation functions can be controlled with one hand. The secret of the dictation system 730 is its easy and fast access to any part of the tape. It offers efficient dictation and transcription, thanks to the visual workflow display. Your recordings can be identified and located easily based on their priority and length. Audible scan allows you to find specific parts of dictations easily. The optional foot pedal LFH2210 for hands-free playback control and the professional transcription headphones LFH0234 turn your Philips desktop dictation system into a transcription machine. The high-quality microphone picks up every acoustic detail for perfect sound reproduction. The built-in front speaker guarantees crystal clear playback of your dictation files. Recording sensitivity can be changed to avoid background noises and adjust to the recording environment. The large display shows all the information needed to manage the workload. It shows important information such as cassette length and remaining recording time.